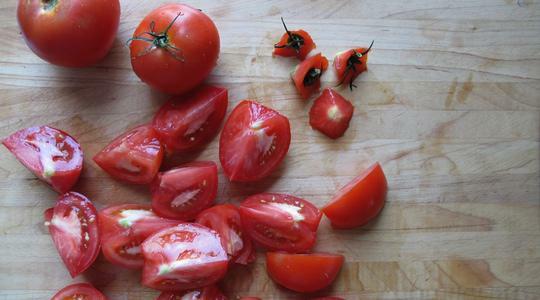 Using the tip of your chef’s knife, cut out the cores of the tomatoes. Cut the tomatoes into quarters. 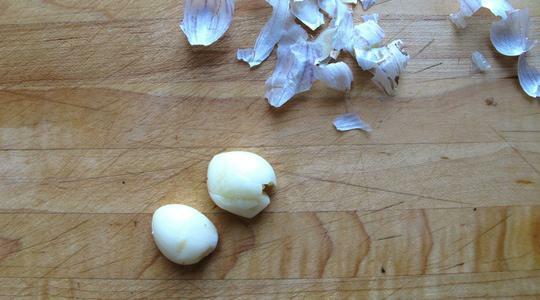 Cut the bell pepper into quarters then cut out the white membrane and seeds. Cut the quartered pieces in half again. 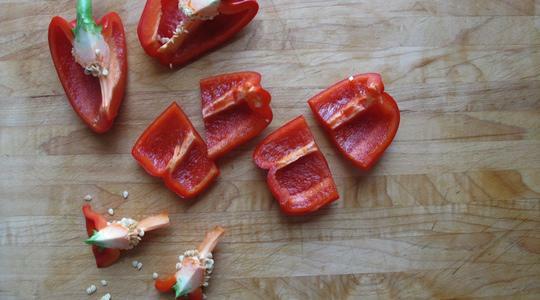 Put the bell pepper and half of the tomatoes into a blender. 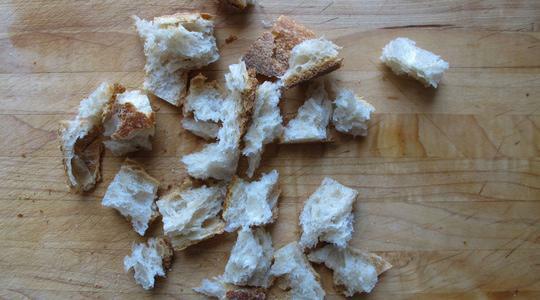 Tear the 2-inch piece of baguette into small pieces and add to the blender along with garlic, oil, vinegar, salt, black pepper (about 12 turns on pepper mill), and red pepper (if you like a little spice). Blend until smooth, about 1 minute. Add the remaining tomatoes and blend until smooth and creamy. Refrigerate 1 hour until well chilled. 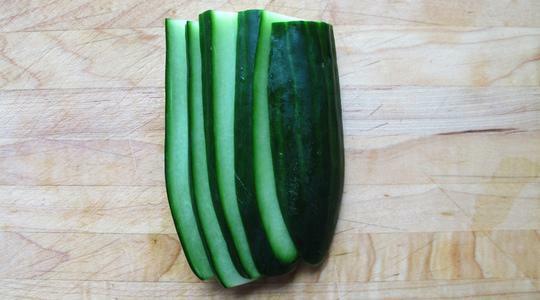 Meanwhile, dice the cucumber: first cut it lengthwise into 1/4-inch thick slices. 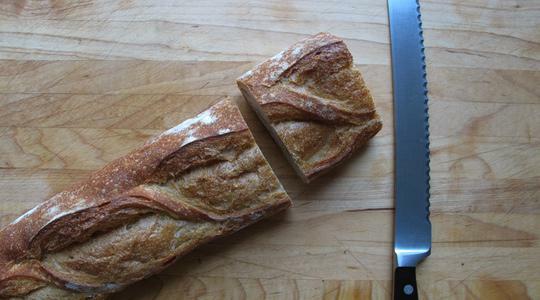 Then cut each slice lengthwise into long 1/4-inch thick strips. Cut those strips crosswise into small squares (this is called a dice). 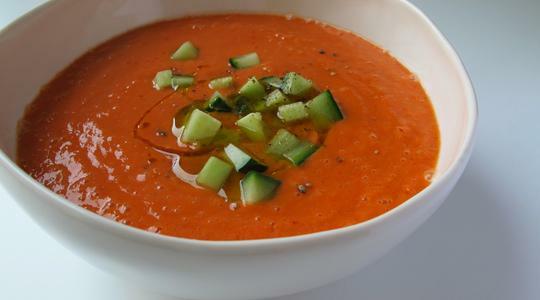 Give the gazpacho a quick whirl on the blender then serve it up. 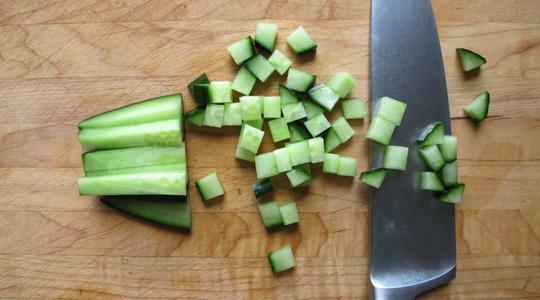 Top with the diced cucumber and a drizzle of oil.